Nurses who conduct research have a longstanding interest in questions of nursing knowledge. 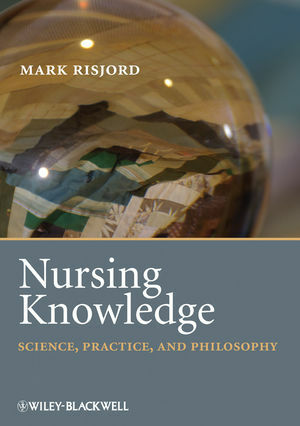 Nursing Knowledge is a clear and well-informed exposition of the philosophical background to nursing theory and research. Nursing Knowledge answers such fundamental questions as: How is nursing theory related to nursing practice? What are the core elements of nursing knowledge? What makes nursing research distinctive as nursing research? It examines the history of the philosophical debates within nursing, critiques the arguments, explains the implications and sets out to rethink the philosophical foundation of nursing science. Nursing Knowledge begins with philosophical problems that arise within nursing science. It then considers various solutions with the help of philosophical ideas arguingargues that nurses ought to adopt certain philosophical positions because they are the best solutions to the problems that nurses encounter. The book argues claims that the nursing standpoint has the potential to disclose a more complete understanding of human health than the common disease-and-dysfunction views. Because of the relationship to practice, nursing science may freely draw theory from other disciplines and nursing practice unifies nursing research. By redefining theory and philosophy,With a new philosophical perspective on nursing science, the so-called relevance gap between nursing theory and practice can be closed. Theory research must provide the knowledge base necessary for nurse interventions, training, patient education, etc. Examines epistemology (how we know what we know), theory development, and the philosophical foundations of scientific methodology. Dr. Mark Risjord is Associate Professor in Philosophy at Emory University, and has a faculty appointment in the Nell Hodgson Woodruff School of Nursing. His main research areas have been in the philosophy of social science and the philosophy of medicine. He was invited to has been teaching philosophy of science and theory development in the new PhD program in the Nell Hodgson School of Nursing at Emory University insince 1999. He has been awarded two competitive teaching prizes: Emory Williams Distinguished Teaching Award (2004) and the Excellence in Teaching Award (1997). He is presently serving as the Masse-Martin/NEH Distinguished Teaching Chair (2006-2010). Dr. Mark Risjord is Associate Professor in Philosophy at Emory University, and has a faculty appointment in the Nell Hodgson Woodruff School of Nursing. His main research areas have been in the philosophy of social science and the philosophy of medicine. He has been teaching philosophy of science and theory development in the PhD program in the Nell Hodgson School of Nursing at Emory University since 1999. He has been awarded two competitive teaching prizes: Emory Williams Distinguished Teaching Award (2004) and the Excellence in Teaching Award (1997). He is presently serving as the Masse-Martin/NEH Distinguished Teaching Chair (2006-2010). PART I NURSING KNOWLEDGE AND THE CHALLENGE OF RELEVANCE. Two kinds of theory–practice gap. 1 Prehistory of the problem. Professionalization and the translation gap. Nursing education reform in the United States. What would a nursing science look like? Nursing theory and nursing knowledge. Conclusion: the relevance gap appears. 2 Opening the relevance gap. Two conceptions of nursing science. The demise of practice theory. The argument from value freedom. The argument from theory structure. Donaldson and Crowley on the discipline. Fawcett on the levels of theory. Conclusion: the relevance gap endures. 3 Toward a philosophy of nursing science. Science, value, and the nursing standpoint. Theory, science, and nursing knowledge. The received view of theory. Explanatory coherence and inter-level models. PART II VALUES AND THE NURSING STANDPOINT. 4 Practice values and the disciplinary knowledge base. Dickoff and James’ practice theory. Challenges to Dickoff and James’ criteria. The disintegration of nursing knowledge. The obfuscation of evaluative commitments. The role of theory in ethical knowledge. Conclusion: fact and value in nursing knowledge. 5 Models of value-laden science. The Johnson model: nursing values as guides for theory. Constitutive values in science: Kuhn’s argument. Value-laden concepts in nursing inquiry. Conclusion: constitutive moral and political values in nursing inquiry. 6 Standpoint epistemology and nursing knowledge. Social role and epistemic privilege. Feminist appropriation of standpoint epistemology. Knowledge and the division of labor in health care. Nursing knowledge and nursing roles. Conclusion: nursing knowledge as an epistemic standpoint. Top-down and bottom-up views of nursing. Values in the nursing standpoint. What is the nursing role? How are the boundaries of the profession determined? Is nursing an applied science? PART III NURSING THEORY AND THE PHILOSOPHY OF SCIENCE. 8 Logical positivism and mid-century philosophy of science. Conceptions of theory in nursing. Challenges to an axiomatic treatment of theory. Theory structure: the received view. Conclusion: logical positivism and scientific knowledge. Did logical positivism influence nursing? Positivism and the critique of nursing metatheory. How the levels are distinguished. How the levels are related. Why the levels are supposed to be necessary. Conclusion: the relevance gap and the philosophy of science. 10 Rejecting the received view. The necessity of auxiliary hypotheses. Auxiliary hypotheses and borrowed theory. Failure of the theory–observation distinction. The vagueness of the distinction. Levels of theory and interdisciplinary research. Theory change and level mixing. Conclusion: rejecting the received view of nursing science. PART IV THE IDEA OF A NURSING SCIENCE. Patient responses to radical mastectomy. Sensory and distress components of pain. Breakthrough research and situation-specific theory. 12 The structure of theory. Borrowed theory and the nursing standpoint. 13 Models, mechanisms, and middle-range theory. An old, new definition of middle-range theory. The semantic conception and the received view. Middle-range theories as theoretical models. Physical and nonphysical theoretical models. The challenge of precision in nursing models. Interlevel models in nursing science. Theoretical models and explanatory coherence. Holism, reductionism, and the nursing standpoint. The holistic patient care argument. The causation and control argument. Causality, holism, and professional values. Conclusion: causal models and nursing science. PART V CONCEPTS AND THEORIES. Concept analysis and borrowed theory. Conclusion: philosophical foundations of multifaceted concepts. Theory development and multifaceted concepts. Concepts, borrowed theory, and interlevel models. 15 Conceptual models and the fate of grand theory. The orientation and abstraction pictures. Arguments against the abstraction picture. Harmful effects of the abstraction picture. Advantages of the orientation picture. Nursing pedagogy and early theory. Models of nursing and models for nursing. Conceptual models as nursing philosophy. Philosophical criticism of conceptual models. Conclusion: science, practice, and philosophy. PART VI PARADIGM, THEORY, AND METHOD. 16 The rise of qualitative research. Making space for qualitative methodology: Carper, Benner, and Watson. Two paradigms of nursing inquiry. Conclusion: method, theory, and paradigm. 17 What is a paradigm? Conclusion: nursing science without paradigms. 18 Methodological separatism and reconciliation. The unity of nursing knowledge. Reconciling qualitative and quantitative research. A new perspective on theory. New questions about nursing theory. Professional values and disciplinary knowledge. Nursing knowledge and the relevance gap. New questions about evidence-based nursing practice.